Looking to trade the daily grind for eye-opening adventures? 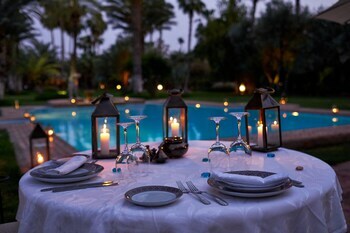 Now's the time to make your Marrakech dreams come to life! 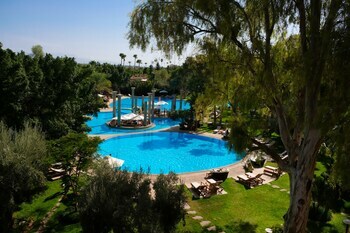 Ready to rejuvenate your spirit with some pure Marrakech magic? The team at ebookers are wizards at turning travel dreams into unforgettable journeys. Who can say no to a bargain? When you arrange both your airfares and hotels through us, you'll get a discount of up to 16%*. We can't think of many things more pleasurable than a hard-earned escape. With over 500 partner airlines and more than 500,000 properties globally, your next laid-back adventure is only a few clicks away. 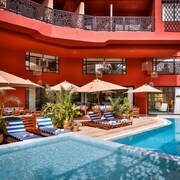 We have so much faith in our offer that if you secure a Flight + Hotel package now with ebookers and come across a better deal within 48 hours pre check in, we'll meet it and repay the difference. We call that our Price Guarantee. Get ready to get stuck into your travel bucket list. It doesn't matter if it's a snow-covered mountain or a tropical rainforest, we'll help you satiate each and every last wanderlust. Terms and Conditions apply. 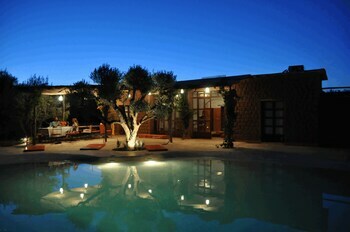 Marrakech lies 15 miles away from Loudaya, and 180 miles away from Rabat, the nation's capital. Ebookers customers probably know this already, but Jamaa el Fna is not to be missed. As far as iconic attractions go, it's one of the best. Seeking a great family day out? 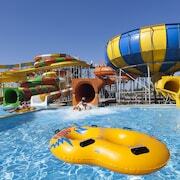 Reward the kids with a trip to the Cinema Megarama and Oasiria Water Park. 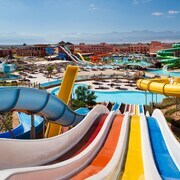 La Plage Rouge is another exciting attraction that will put a smile on everyone's faces! 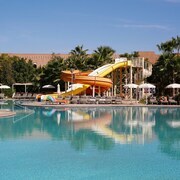 To find your festive spirit, swing by the Casino de Marrakech or the Le Grand Casino de la Mamounia. 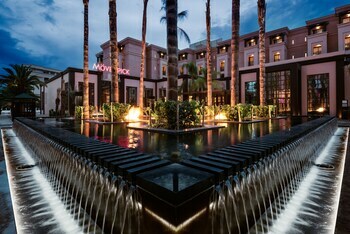 Challenge the blackjack dealer or simply go for a stroll and soak in the glittering lights and lively atmosphere. You don't need to be an expert gardener to marvel at the creative floral displays and immaculate garden beds at the Le Jardin Secret. Go for a wander along its inviting pathways and see if there are any upcoming talks or demonstrations. When you need to get away from the fast pace of the city, retreat to one of the city's green spaces like the Menara Gardens or Agdal Gardens. Alternatively, get some exercise and keep the kids on the go by exploring Cyber Parc or Place of Youth. Is it about that time to head out into nature for a bit of fresh air? Chill out among the pleasant surrounds of Takerkoust Dam and Toubkal National Park. 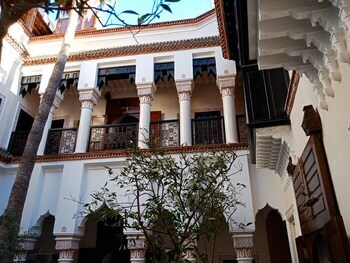 The Marrakesh Museum and the Dar Si Said Museum are ideal places to escape a less-than-perfect day. Study the engaging displays and ask the friendly staff about group tours and other special events! Need more? Also go to the Museum of Islamic Art and the Maison de la Photographie. Grab a cup of coffee and enjoy a few hours gallery hopping between the Dar Tiskiwin Museum and the Museum Palmeraie. Filled to the brim with beautiful canvases and sculptures, these popular exhibits offer something for all tastes. Enjoy exhibitions full of artefacts and images that tell the captivating story of the area at the Ecomusee Berbere. 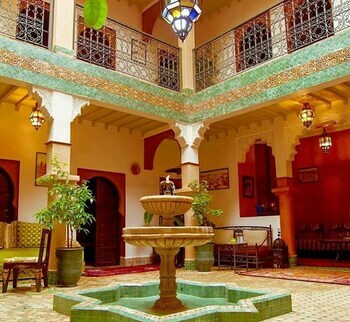 Marrakech is home to many fascinating historic sites. 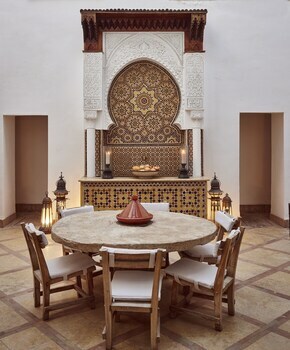 Why not start exploring this destination's past at Saadian Tombs and Bahia Palace? If you're eager for more, the Almoravid Koubba and the Medersa Ben Youssef should be next on your itinerary. Have you ever wondered what it'd be like to live in luxury? 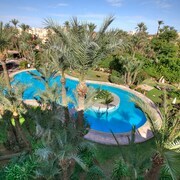 Take a walk around the impressive grounds of El Badi Palace as you imagine the lives of its most famous inhabitants. 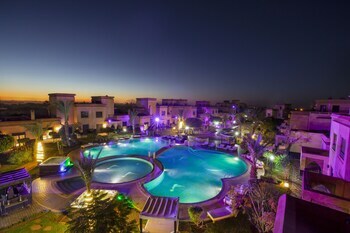 Royal Palace is another striking abode that is not to be missed. Whatever your beliefs, the Koutoubia Minaret and the Ben Youssef Mosque are great places to check in with your spiritual side. 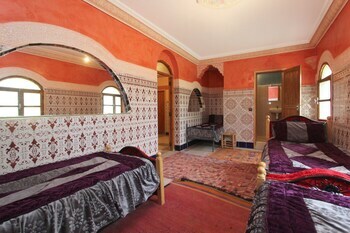 The Mouassine Mosque and the Kasbah Mosque will also appeal to anyone looking for some prayer and self-reflection. For centuries, urban squares have been spaces where people come together to gossip, catch up, eavesdrop, show off and more. No matter your reason for visiting, Place Bab Doukkala and Rahba Kedima are some of the best places to get familiar with this city. Built as testaments to Marrakech's significant past, the Bab Agnaou and the Bab Debbagh have lots of tales to share. If you happen to be in the area, the Bab Doukkala Mosque and Bab El Djedid are two more historical structures that are worth stopping by. We hope you took into consideration Marrakech's nice range of shopping centres when you set your budget! A few hours at Souk El Bahja and Souk Laghzel could make a noticeable dent if you're not careful. Next stop is Marjane Hypermarket or Souk Smarine, where you'll find plenty more inviting outlets to pore over. After all, a shopper can never have too much retail therapy! Theatre Royal is where you should go for some entertainment. Find out what's happening and buy some tickets. Soak up your surrounds as you wander around Place du 16 November. Fantastic stay. 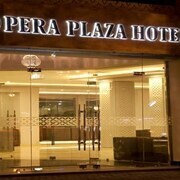 The hotel was clean, staff were extremely friendly & efficient. 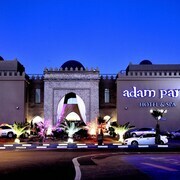 Amazing hotel Great staff service. 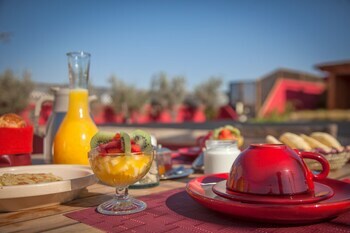 Breakfast was really nice- the pool was great!!! Bed was so comfy. I got a big double room witch was a bonus when I only paid for a single room!! I would defetly recommend this hotel!!! Hotel very nice. Breakfast good. Evening meal could be improved. C est 1 usine a touristes mal entretenu chambre vetuste, restaurant cantine, bruyant.Le point positif est le parc aquatique. Just back from a week holiday and couldn't fault the Hotel in any way. The whole place is spotless, the facilities are excellent and the animation team were really super. Would highly recommend. 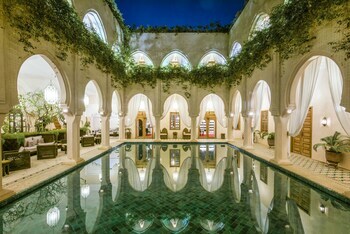 Riad Mboja "Chez Ali Baba"